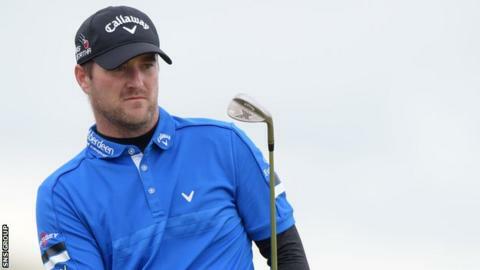 Marc Warren aims to build on the experience of challenging at The Open as he prepares for this week's US PGA Championship at Whistling Straits. The 34-year-old Scot teed off in the penultimate group for the third round at St Andrews, only to finish 40th. "The more you put yourself in that situation, the easier it becomes," Warren told BBC Sport. "Hopefully, that is all experience in the bank and the more majors you play the more comfortable you become." At 51st in the world standings, Warren is the highest ranked of the seven Scots in the field in Wisconsin and has a good record at the season's final major. "I've been top 15 in the last couple of years and I'm looking forward to another good week," explained the Glaswegian. "To be the highest ranked Scot is nice. I've played some of the most consistent golf of my career this year. "My confidence is good and I can't wait to get started. It's a spectacular place, one of the most visually stunning courses I've ever seen." No Scot has won the US PGA Championship since Tommy Armour 85 years ago, with Warren joined at Whistling Straits by Stephen Gallacher, Richie Ramsay, Russell Knox, Martin Laird, Steven Young and Senior PGA champion Colin Montgomerie. However, Knox insists his focus is simply enjoyment rather than dreaming of a challenge. The 30-year-old from Inverness missed the cut on his Open debut this year and thinks a desire to impress on home soil affected his game. "I put too much pressure on myself at St Andrews to do well," said the US-based player. "This is my second PGA, my fourth major, so it's unrealistic to say I'm going to go ahead and win it. "I'd like to feel good while I'm playing. Just relax and make nice swings. I'm just going to let rip here and see what I can do. "I don't have the experience of most of the guys here but good golf beats experience every time."